SimpleMind for Windows can connect to any cloud, as long as the cloud app creates a directory on your computer and syncs that directory to its cloud. SimpleMind relies on this cloud app for the actual synchronization. Step 1: Connect SimpleMind for Windows to a cloud/external directory. Install the cloud app of your choice, for example Dropbox. Click the add cloud icon, next click “Add Cloud”. Select “Kind”, for example Dropbox. 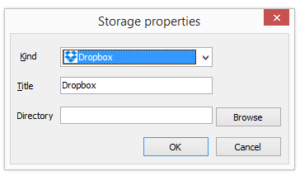 Please note: Do not select a folder in Dropbox, for example C:\Users\name\Dropbox\folder. This will cause problems when syncing with other computers/devices that have SimpleMind installed. Press OK. This adds a new cloud tab in the Mind Map Explorer. Click this cloud tab to see all folders and relevant files in the cloud. Step 2:Copy existing local mind maps to the cloud. To copy, right click – “Copy/Move”. Select the folder you want to copy to and click “Copy”. You can now delete the copied local mind maps, they are now mere copies. Mind maps open and save directly in the external folder (cloud). The cloud application synchronizes the changes in your mind map. Open mind maps from within SimpleMind only. Opening a mind map from outside SimpleMind, for example via the Dropbox app or the explorer, will import the mind map as a new local mind map.